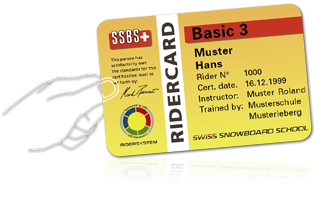 Once you have attended a course, you automatically become a RiderSystem member and will receive Rider Card as confirmation. You can take part in any course – just define your level. Your Swiss Snowboard School will advise you. A course comprises at least 4 to 5 lessons, each lasting at least 2 hours. If you lose your Rider Card, just contact the SSBS secretariat to get things sorted out. Copyright 2019, Chris Gysi, design by Adora Template. Progression Studios.